Honda, a company best known for producing oddly-styled crossovers and front-wheel drive economy cars, may have once also sold an exciting rear-wheel-drive two-seater sports car, according to some historical documents and contemporary research. Odd as it may sound, there is compelling evidence to suggest that Honda, again, Honda, the same company that makes the CR-V, once not only produced but also sold a car called the “S2000” from 1999 through 2009. A number of sources seem to corroborate this theory. What appear to be brochures for this mysterious Honda can be found on a number of different websites, implying that such a car was purchasable by ordinary people across the globe. I myself have found a number of what seem to be publicity photos for the convertible, oddly configured with a removable hardtop. These buyers would have been treated to a fine-handling chassis, a sharp six-speed manual transmission, well-designed double-wishbone suspension and an aggressive naturally-aspirated four-cylinder engine mounted front-to-back in the chassis. I understand that this is difficult to believe, but I am only repeating what I have seen from this historical evidence. An early version of this engine displaced 2.0 liters and redlined at 9,000 RPM, making around 240 horsepower and something close to 160 lb-ft of torque. A later 2.2-liter version redlined at 8,200 RPM but made slightly more torque. At least, these are the figures put forward by a number of leading archivists with whom I have conferred. 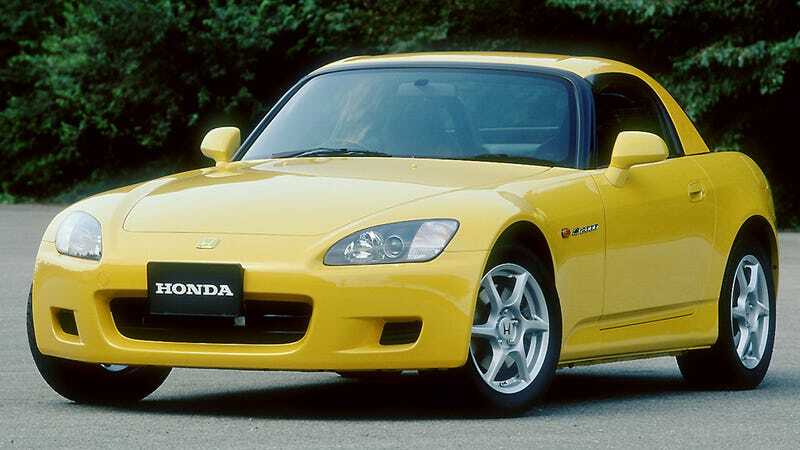 Any hard evidence that Honda once made such a car is difficult to come by, and making definitive statements about the existence of the S2000 would be rash and irresponsible. For now the S2000 may have to remain a theoretical presence, slightly beyond the realm of belief.